A lot of research has been done lately (see Library) on the hoofs of wild mustangs living in America. These mustangs have healthy, strong hoofs with which they walk, trot and gallop 20 to 50 kilometers a day on hard surfaces with rocks and stones. Growth and wear are in balance. The hoof and leg problems that shod domesticated horses so frequently experience, are practically absent in the wild. 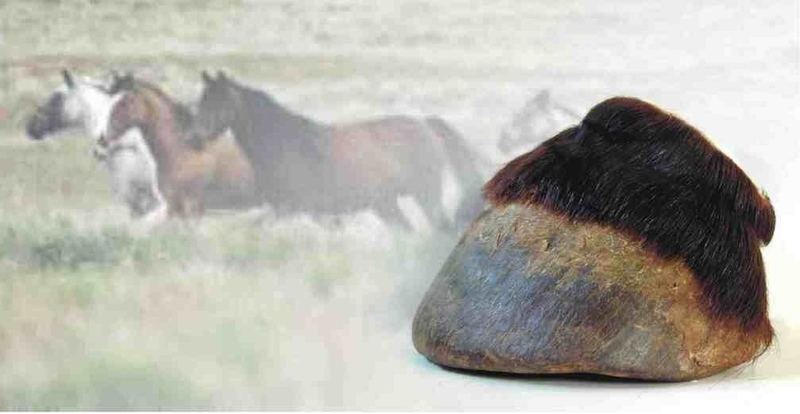 The wild horse’s hoof mechanism works perfectly and as a result they have hard hoofs, strong legs and optimal blood circulation. The hoofs of wild mustangs have short heels, the frog has passive ground contact to function as shock breaker, and the horse’s weight is evenly distributed over the weight-bearing surfaces, i.e. the soles of the four hoofs. This wild hoof model we use when we trim the horse’s hoof. As domestic horses do not have the necessity and opportunity to walk over distances of 20 to 50 kilometers every day, we need to imitate natural wear by trimming the hoofs regularly to keep them in their natural shape. All our horses go barefoot. Some of our horses have come from quite challenging backgrounds as they were shod and stabled, and some had fairly severe hoof issues when they came to us, but are either in excellent shape or are well on their way now. What is important in natural hoof care is that it extends to the complete lifestyle of the horse. This lifestyle includes: 1. Natural living conditions: this means freedom of movement (no box-stall confinement) - optimally living in a pasture or paddock for 24 hours a day/7 days a week in the company of other horses. Horse clothing (bandages, wraps, blankets, etc) is to be avoided. 2. Exercise: besides roaming and playing, the horse needs to be trained, hand-walked over hard surfaces and ridden as much as possible, aiming for the natural amount of movement of a minimum of 15 kilometers per day. 3. Nutrition: mature grass and hay form the main food of horses. For extra stamina or weight gain, just a little oats can't be beat. In this manner, the barefoot hoofs become strong, healthy, and fully functioning, and the entire immune system of the horse is strengthened naturally. This place (...) would be best suited in the purpose of strengthening the horse’s feet if you threw down loosely four or five cartloads of round stones, each big enough to fill your hand. (...) Stones threwn about in this way strengthen the frogs too. (p. 28-29). The hoof mechanism can be defined as the natural expanding or spreading of the hoof as it undergoes weight bearing during the hoof’s support phase, and, the reciprocal contracting of the hoof as it unloads during its flight phase. This mechanism pumps the blood around the hoof and is thus essential for blood circulation, not only in the hoofs and legs, but in the end also throughout the horse’s body. A barefoot hoof is capable of flexing as needed depending on the terrain. The frog and heel bulbs perform an important role in absorbing shock. The lateral cartilages and digital cushion move blood through the foot and actually upward into the heart. All these functions are compromised when a horse is shod. 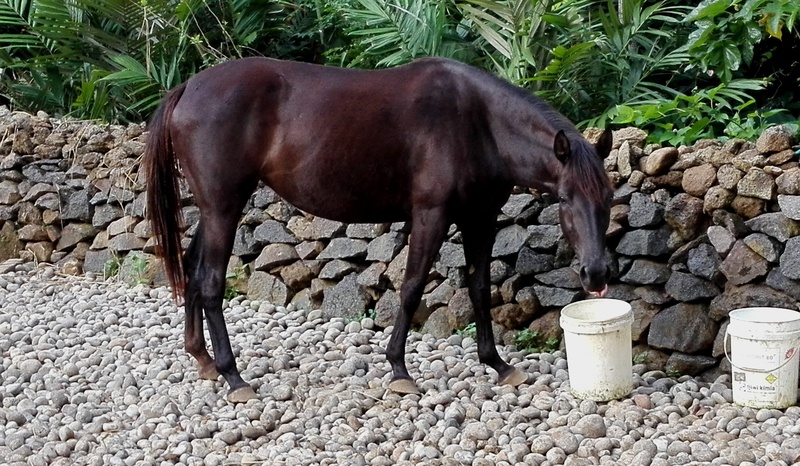 The use of horse shoes and/or confinement causes diminished or hindered blood flow and impacts the hoofs and the general wellbeing of the horse in various harmful ways. Anna van Rheeden was educated in the Netherlands and since 2005 she works as a natural hoof care practitioner, trimming the hoofs of our own and other people’s horses. Contact us for an appointment. Function of the hoof: the hoof mechanism. How to make the transition to barefoot. Natural lifestyle: living conditions, exercise and nutrition. Trimming: tools, theory and practice. Recognize the parts of the hoof in all its different shapes. Practice, practice, practice on the hoofs of Havana Horses and/or your own horses. 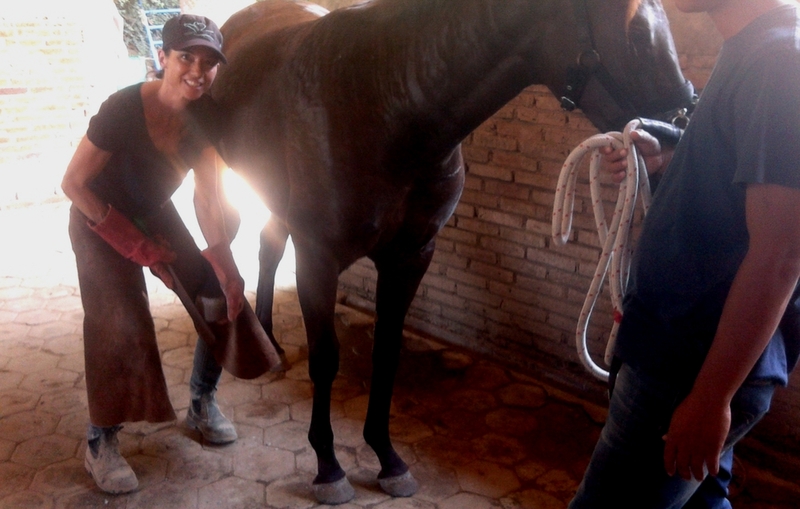 After following this course you feel practiced and confident enough to trim the hoofs of your own horse! Improved blood flow which improves horse's overall health. Greater shock absorption so fewer concussion related injuries. Quicker heart rate recovery time after exercise. No more worrying about shoes coming off during a ride/event. Lower risk of injuries when playing in the field. Improved traction - nature designed the hoof so it can adapt to all terrains. Less tripping, stumbling and forging as the horse can feel where its feet are. Download our Leaflet Natural Hoof Care (pdf) here. For prices of today see here.